Join us for a week of delicious food and wine, and a creative week of art and photography. 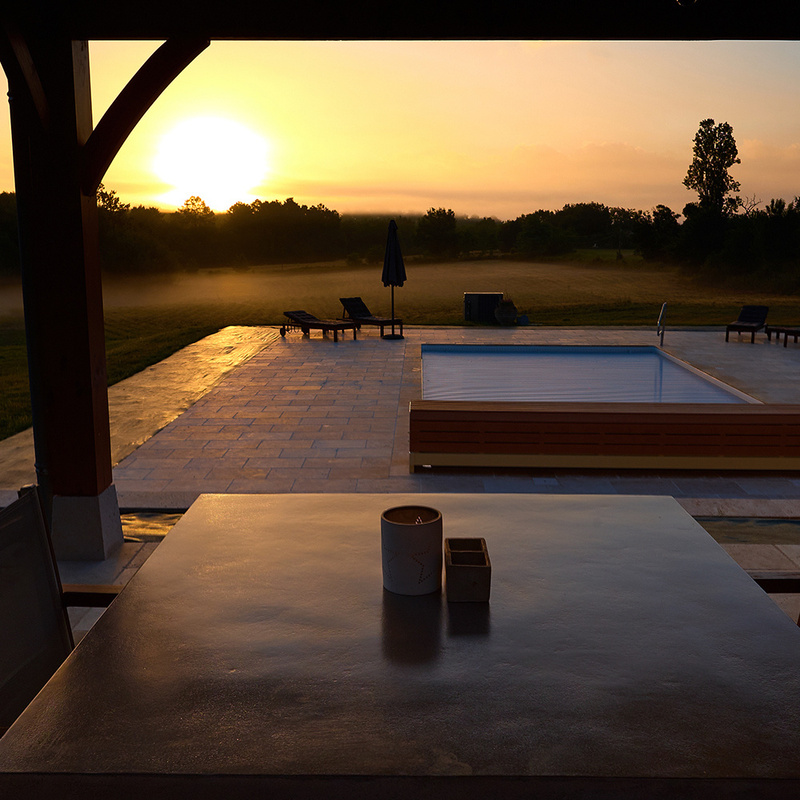 Three stunning barn conversions, each with their own private terrace, share a swimming pool in the Dordogne region of south west France. 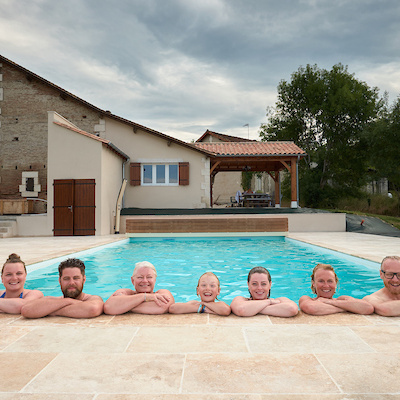 The family friendly gites have been developed to create a comfortable self catering holiday experience in the heart of the Foret de La Double national park in the Perigord blanc. 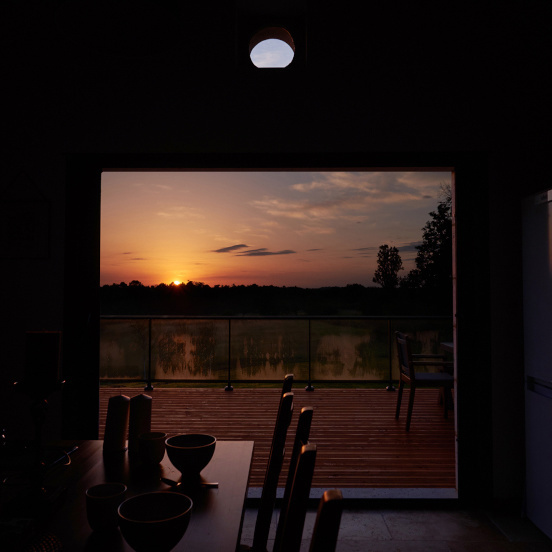 Set in the hamlet of Chadenne within the ancient forest, the properties offer a tranquil setting for relaxing days by the pool and star gazing at night. The properties have attractively landscaped gardens and share outside space both around and away from the pool terrace and are perfect for a relaxing family holiday experience. 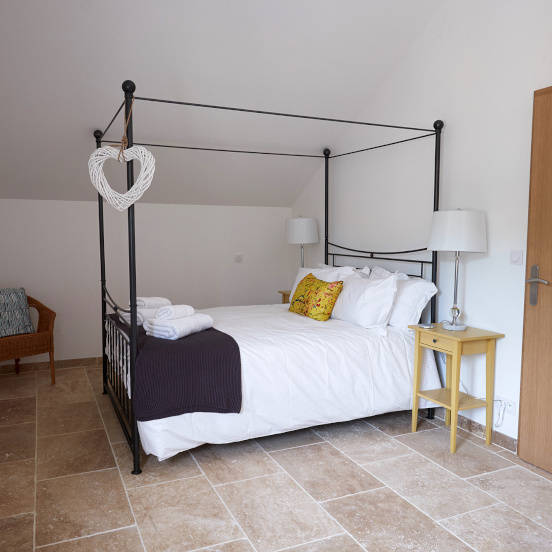 They have been fitted out with high quality furnishings such as hand forged iron beds from Nights in Iron soft furnishings from Nkuku and other items from Design Vintage to provide the urban meets rural vibe. The ancient forest location offers a variety of flora and fauna with many opportunities for both bird and animal watching. The spring sees the distinctive Hoopoe and beautiful Red Kites nesting, cuckoos and woodpeckers making their familiar noise and swifts to nest in the eaves of the barns. There are many other garden birds who visit every day. At night you will be serenaded by the barn and screech owls. The forest is also perfect for walking enthusiasts as the occupation of 'randonne' or hiking is very popular in this area. The forest is criss crossed with walking routes and offers cool shade for summer walking and great opportunities to see the local flora and fauna such as the Roe deer. 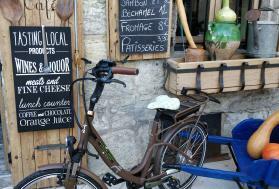 The gites are close to several cycle routes called 'Sentiers du Perigord' for safe off road family holiday cycling. 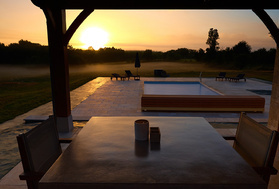 Dordogne cycle hire will deliver to the gites to make your cycling experience stress free. 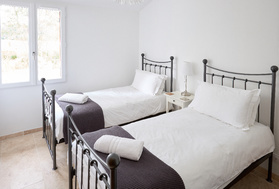 They cater for cyclist of all ages and sizes including tag alongs and bike seats for our younger guests. The gites are located in the quieter, less populated part of the Dordogne with a wealth of beautiful villages and markets on its door step; and are styled with high quality furnishings providing an urban feel to compliment the rural vibe with furniture and accessories from Nights in Iron, Nkuku and Design Vintage. You will be greeted with a welcome pack brimming with wines and foodstuffs for which the Perigord is famous; some of the items will be made from foodstuffs grown on site or foraged nearby. 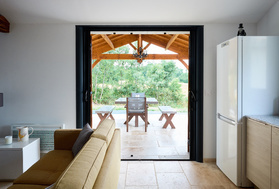 We are passionate about reducing our carbon footprint at Rural Gites so on arrival all guests are provided with a personal water bottle to refill each day to stay hydrated in the warm weather and reduce your holiday plastic. You are welcome to take it home with you after your holiday! 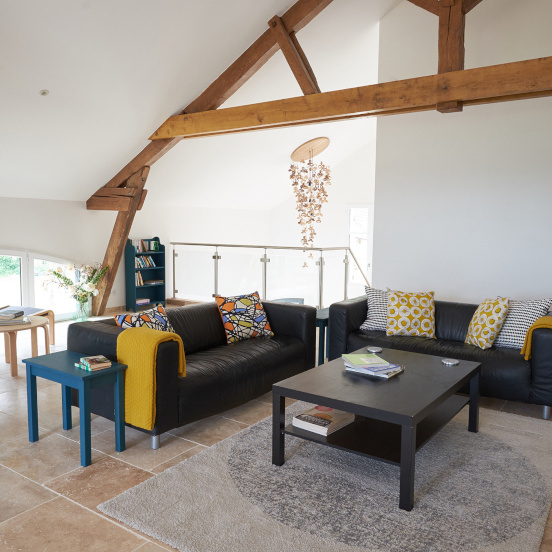 Converted from a working barn, Sanglier has an open plan layout with a contemporary living and dining area, three bedrooms one with an en suite bathroom and a stunning family bathroom with a large free standing bath and walk in shower. 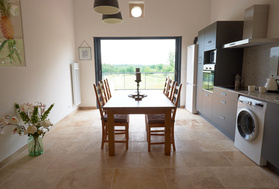 The gite is fitted throughout with travertine marble which extends into the balcony dining and seating area. 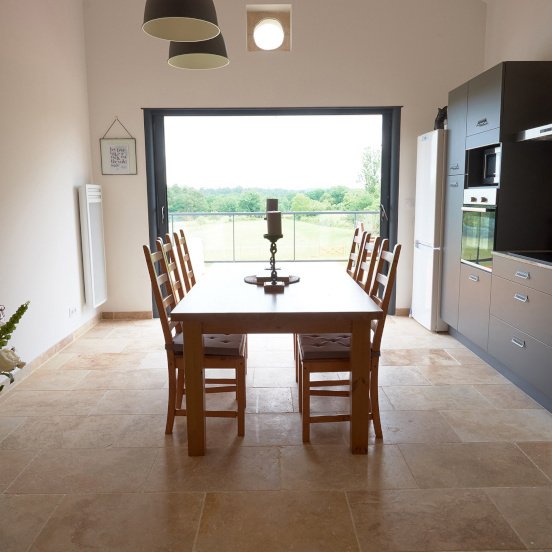 Kitchen - contemporary kitchen is fully equipped with all equipment required for the holiday chef, fine bone china and quality cutlery. 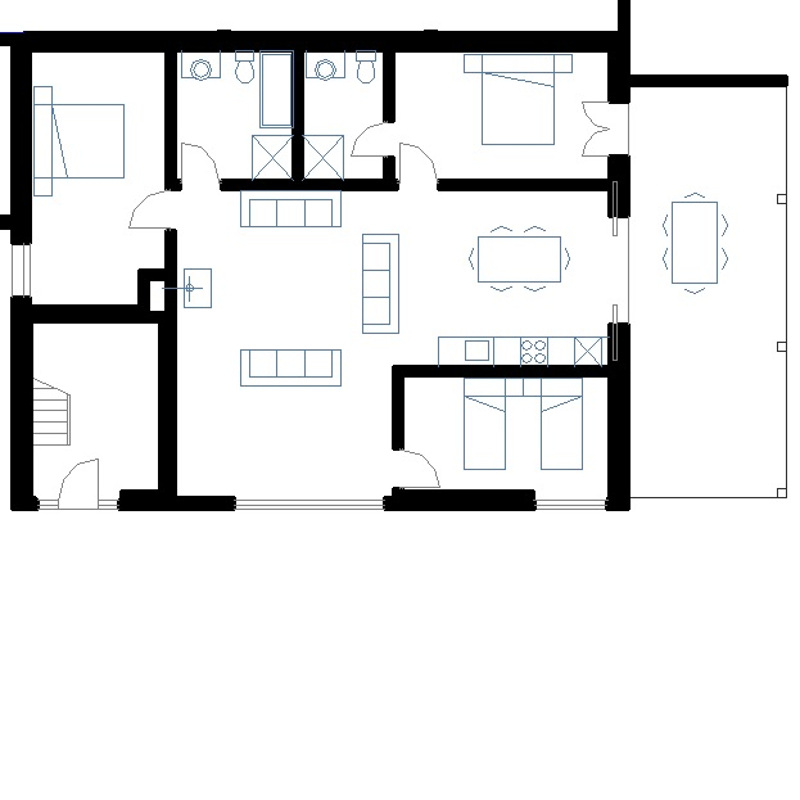 There is a dishwasher and washing machine. Living Room - comfortable sofas, Bluetooth speaker, coffee table and books for the relaxing moments. Dining Area - a table and 6 chairs for indoor dining. 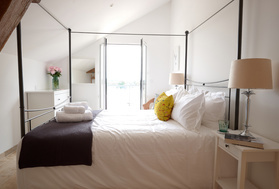 Bedroom 1 - High ceilings and a large window make this room a beautiful space to sleep. 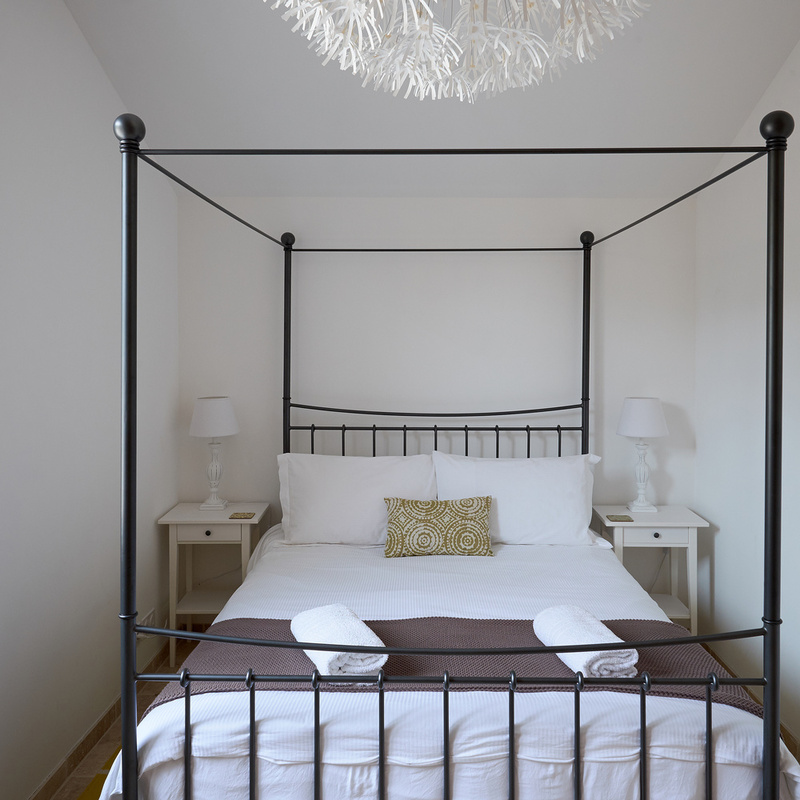 Fitted with luxurious hand forged iron four poster bed with crisp white linen, a large chest of drawers and a hanging unit. 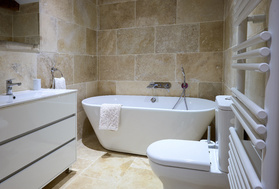 It has an ensuite bedroom, fully tiled with travetine marble. 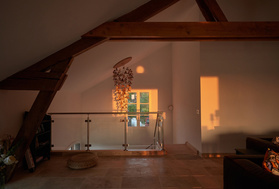 The french windows open onto the balcony and welcome the rising sun. 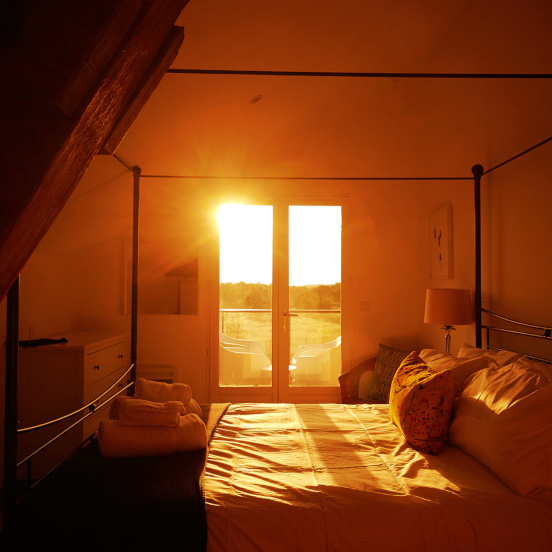 Bedroom 2 - High ceilings and a large window make this room a beautiful space to sleep. 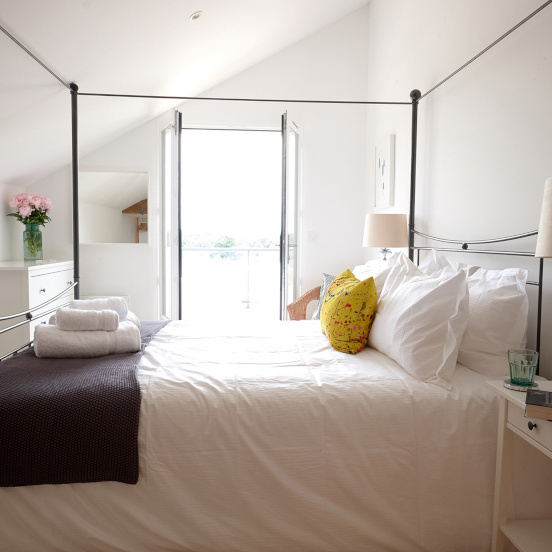 Fitted with luxurious hand forged iron four poster bed with crisp white linen, a large chest of drawers and a hanging unit. 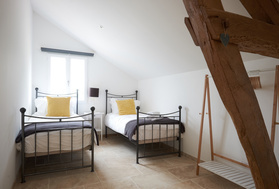 Bedroom 3 - fitted with two hand forged iron single beds with crisp white linen, and a hanging unit. 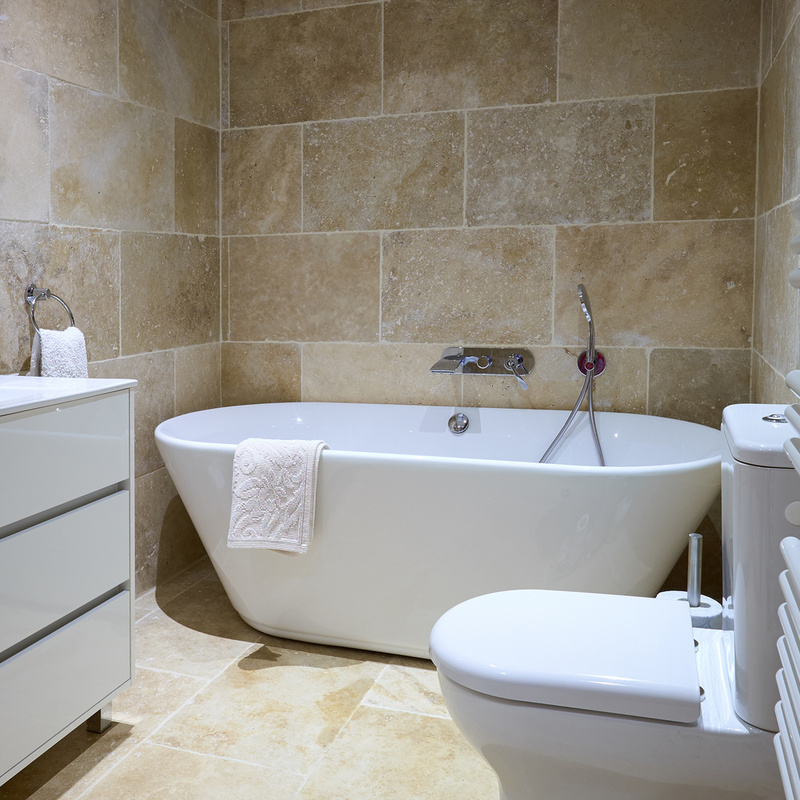 Family Bathroom - this is an elegant space tiled from floor to ceiling with travertine marble and fitted with contemporary white ware. 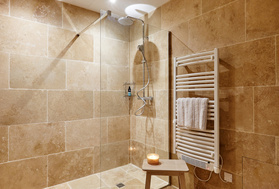 There is a free standing bath large enough for two and a beautiful walk in shower. 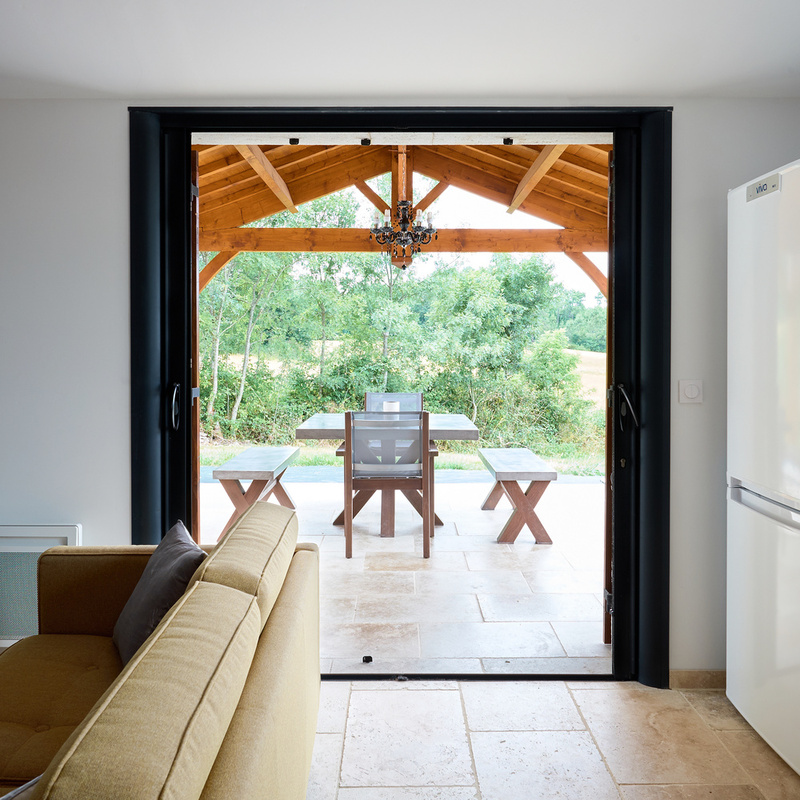 Outdoor Living - the indoor living space moves smoothly outside through the pocket doors to a balcony overlooking the pool, guest garden and our wild meadow field. 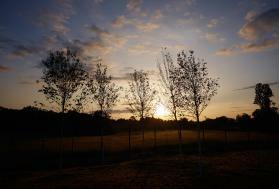 The view from this space is beautiful in the early morning with the sun rising over the fields and forest. 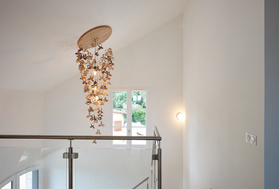 The space is also perfect for that glass of something sparkling in the evening. 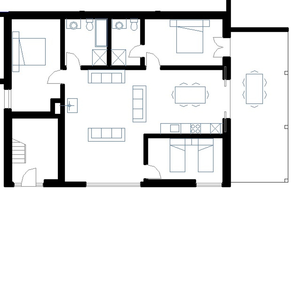 There is a dining table with seating for six, as well as low level seating for relaxing during the day. Child friendly equipment is provided on request. 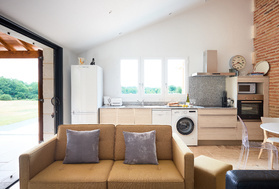 Converted in 2016 Cepe, named after the delicious local mushroom found in the forest, sleeps 4. 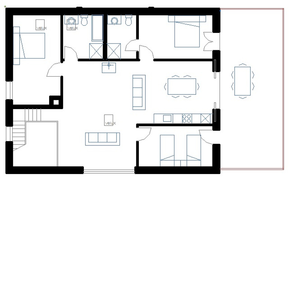 Cepe has an open plan layout with a contemporary kitchen, lounge and dining space. 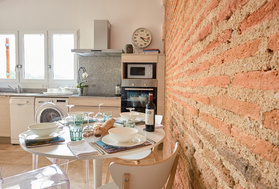 The gite showcases the history of its previous life with original oak beams and beautiful terracotta brick feature wall. 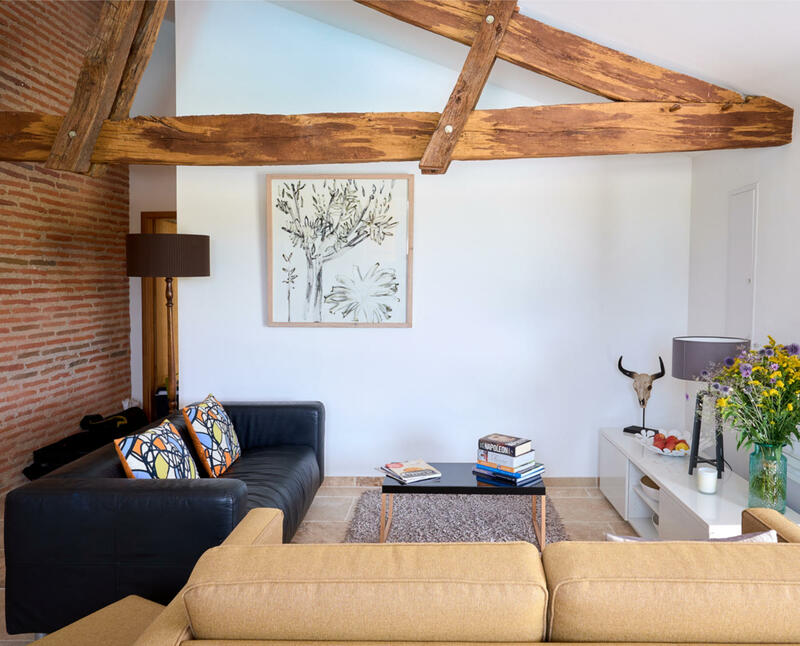 Furnished with stylish sofas and stylish modern furniture the room is complete with an LED TV with English free view channels, DVD player and Wi-Fi. 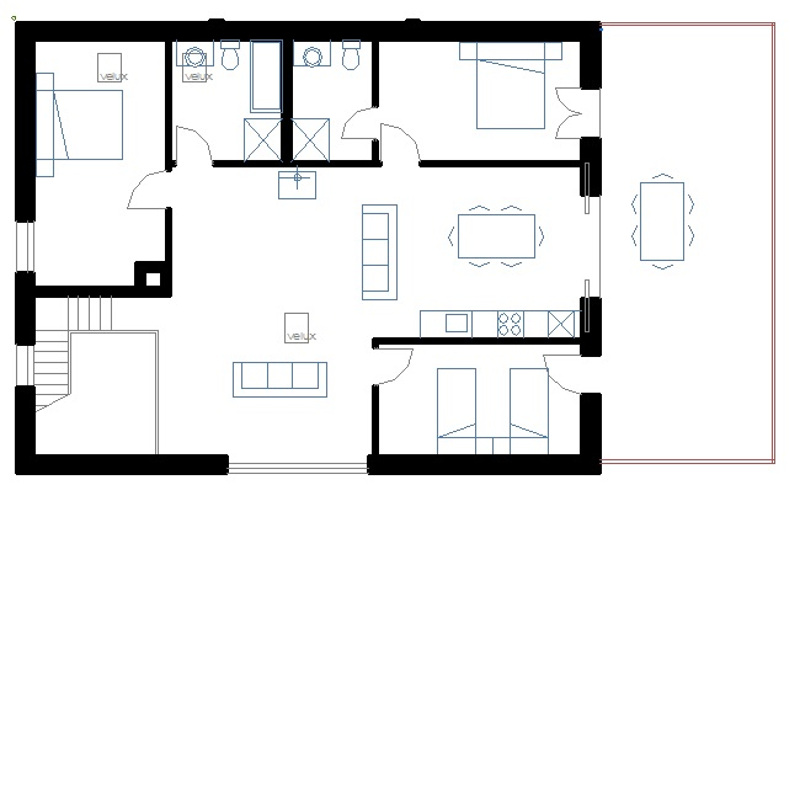 There is a selection of DVD's, books and family games or those quieter indoor moments. 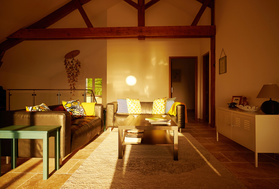 Living room - comfortable sofas, BOSE sound system, coffee table and books for the relaxing moments. Dining area - a round contemporary table and chairs for indoor dining. 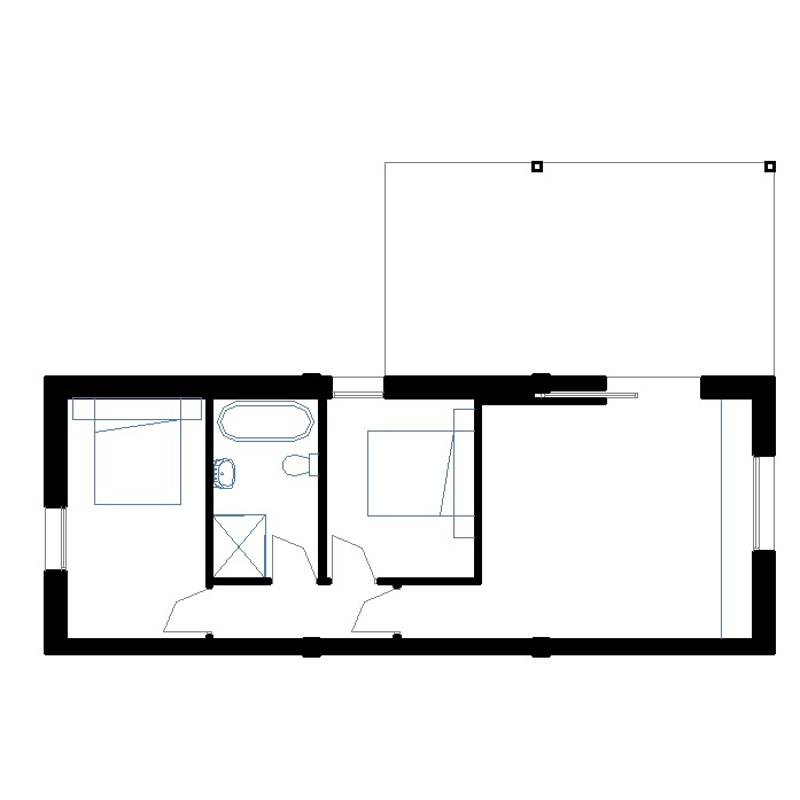 Bedroom 1 - high ceilings and a large window make this room a beautiful space to sleep. 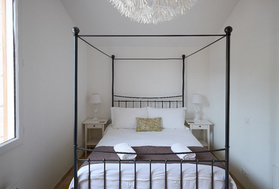 Fitted with luxurious hand forged iron four poster bed with crisp white linen, a large chest of drawers and a hanging unit. 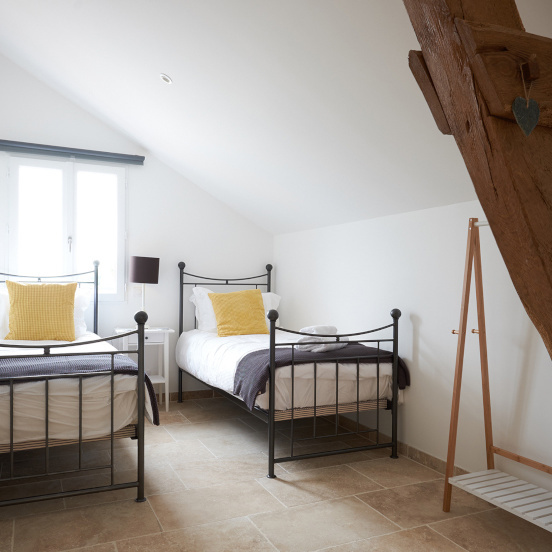 Bedroom 2 - fitted with two hand forged iron single beds with crisp white linen, and a hanging unit. 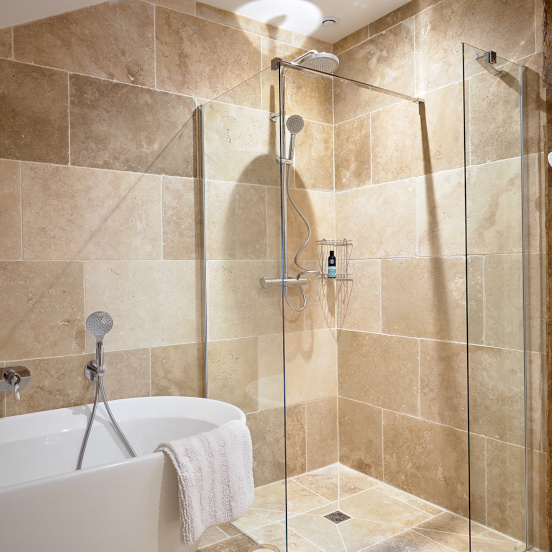 Bathroom - this is an elegant space tiled from floor to ceiling with travertine marble and fitted with contemporary white ware. 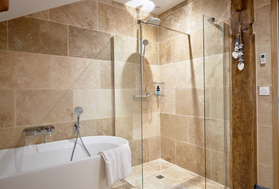 There is a free standing bath large enough for two and a beautiful walk in shower. 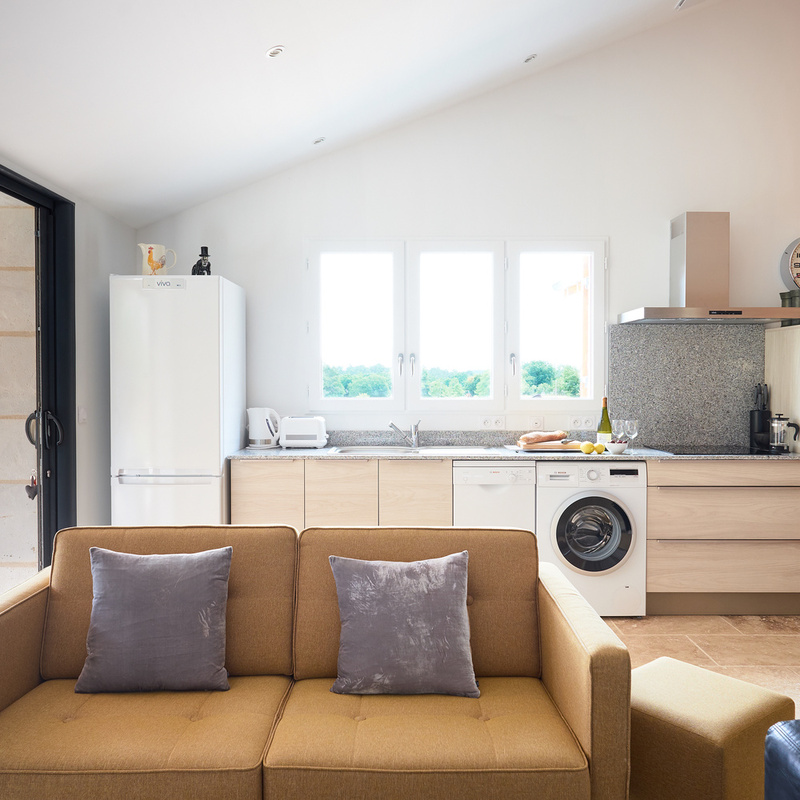 Outdoor living - the indoor living space moves smoothly outside through the pocket doors to a large oak covered private abri for that indoor-outdoor holiday living. 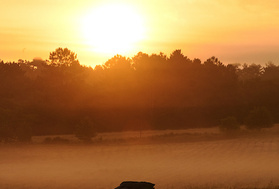 The view from this space is beautiful in the early morning with the sun rising over the fields and forest. 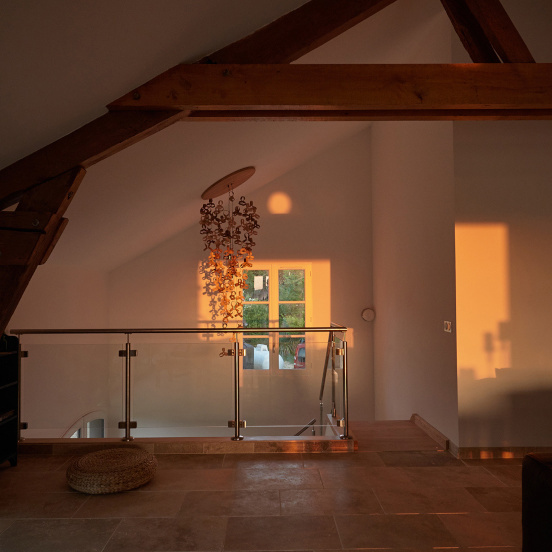 The space is also perfect for that glass of something sparkling in the evening sunshine. There is a fire pit and BBQ, dining table, chairs and bench. 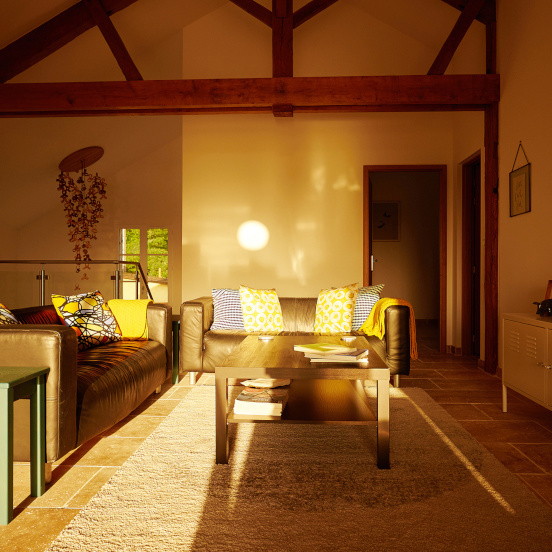 Conversion from a traditional French barn is planned for Autumn 2018. 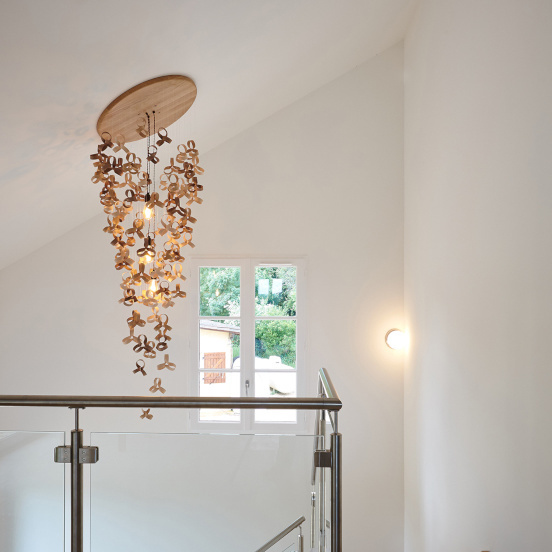 This large contemporary space is named after the local deer which live in the woods and are often seen in the gardens. 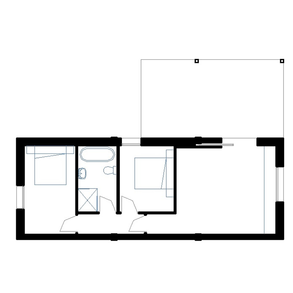 The apartment will have 3 bedrooms, one en suite. There is a large open plan and accessible living and eating space and a large private terrace over looking the swimming pool and gardens. To check the availability, select the month that you're interested in and you will see the availability for any of the gites where the grid is displaying in green. 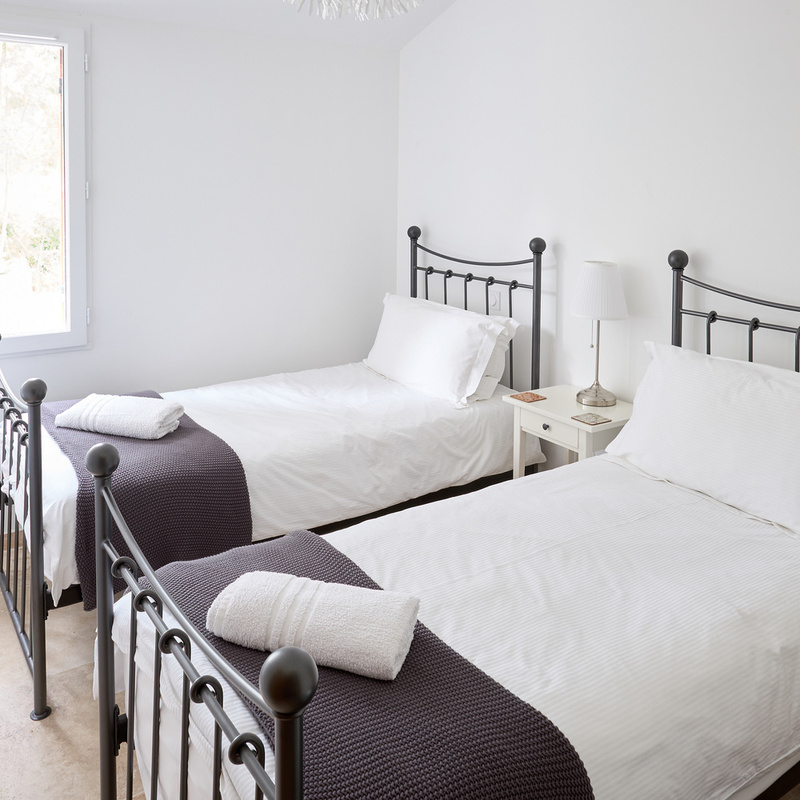 To view the price for any cottage, please click on an available start date (our changeover days are Saturdays) and request the number of nights you want. You can book online by completing the booking form, or you can call or email us if you have any questions or would prefer to book by phone ( +33 (0)7 89 23 78 42 OR +44 (0)7877 098955). The price you see is the price you pay. 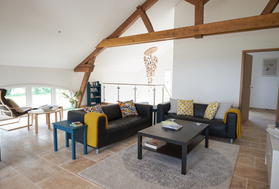 Here at Chadenne we really understand that your holidays are well earned time with family and friends and encourage you to take time to relax, breathe deeply, marvel at the big sky and play together. The pool is heated all year and there are plenty of spaces to relax in the guest gardens. 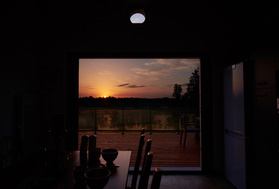 In the quieter times you will be treated to views of the wonderful wildlife and birds. The skies here at Chadenne are huge and sometimes we see some fantastic cloud formations. We encourage you to look up and see which ones you recognise. 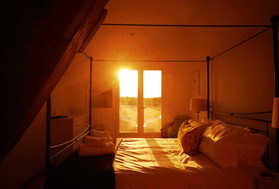 We are members of the Cloud Appreciation Society and each gite has a cloud selector wheel to help with identification. At night the stars are incredible. We are always happy to help you identify the constellations wrapped up in blankets with a cup of chocolat chaud! 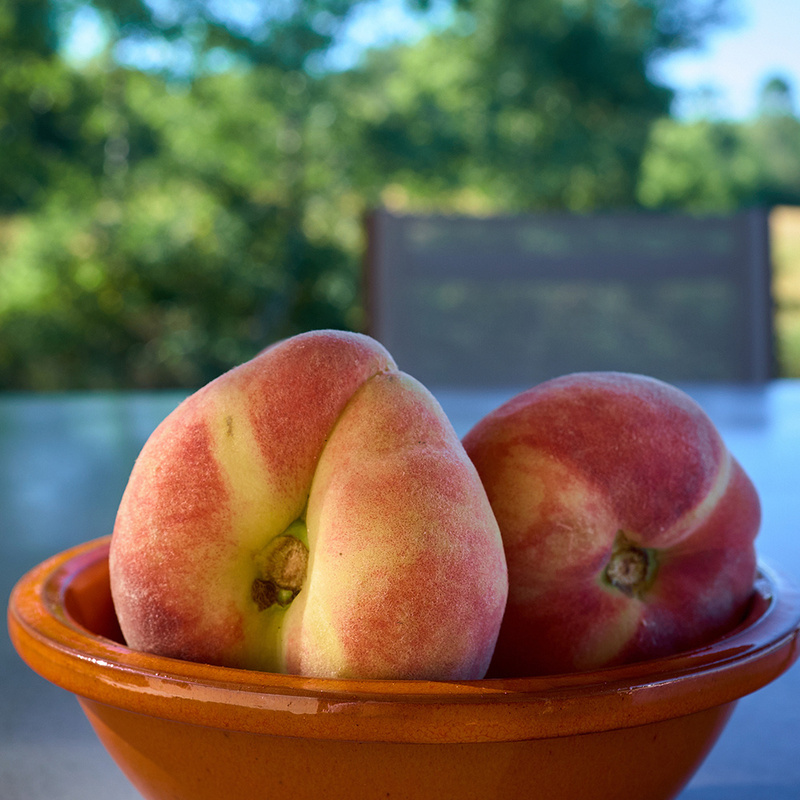 The Perigord Dordogne region is defined by beautiful rivers, ancient forests, beautiful white stone, delicious markets and foodstuffs produced in traditional ways. Our holiday homes are situated to the south west of one of the ancient forests within the Perigord Blanc - the Foret de La Double. This ancient forest retains the serenity of a wild forest and covers about 50,000 hectares to the south west of Perigeuex in the northern part of the Dordogne betwen the rivers Dronne and Isle. The forest was a wild and unruly place until the monks from the nearby Abbaye d'Echourgnac cleared some of it in the 19th century, establishing drainage and wood managment systems reducing marshy areas. 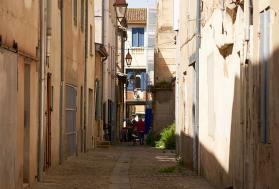 We are five kilometres from the market town of Montpon Menesterol on the banks of the River L'Isle. Montpon has a busy Wednesday market and a park with fishing, caneoing, cycling and walks along the river. All of the places we have visited and shared happy times there so feel very confident recommending them to you. There is much more to see and do so if you find somewhere new, please let us know! Le Ferme du Parcot - trace the history of the life in the Foret de La Double and see how people have worked with the forest over the centuries. A must for the younger gitiste. 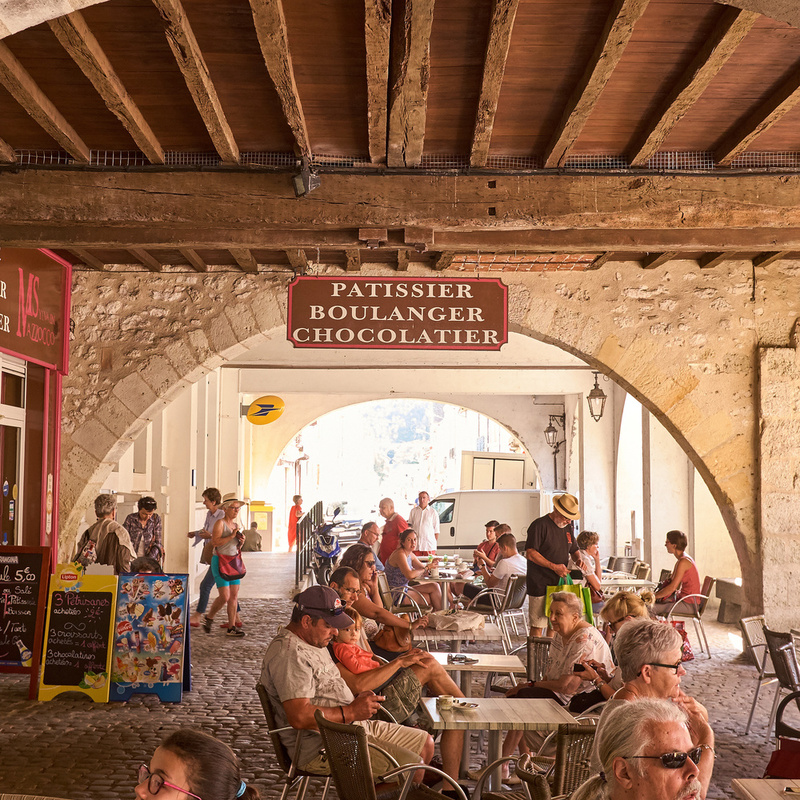 St Emilion - a visit to the Dordogne would not be complete without a visit to this beautiful place, it's a must see for the stunning architecture, caneles, wine and vineyard tours. 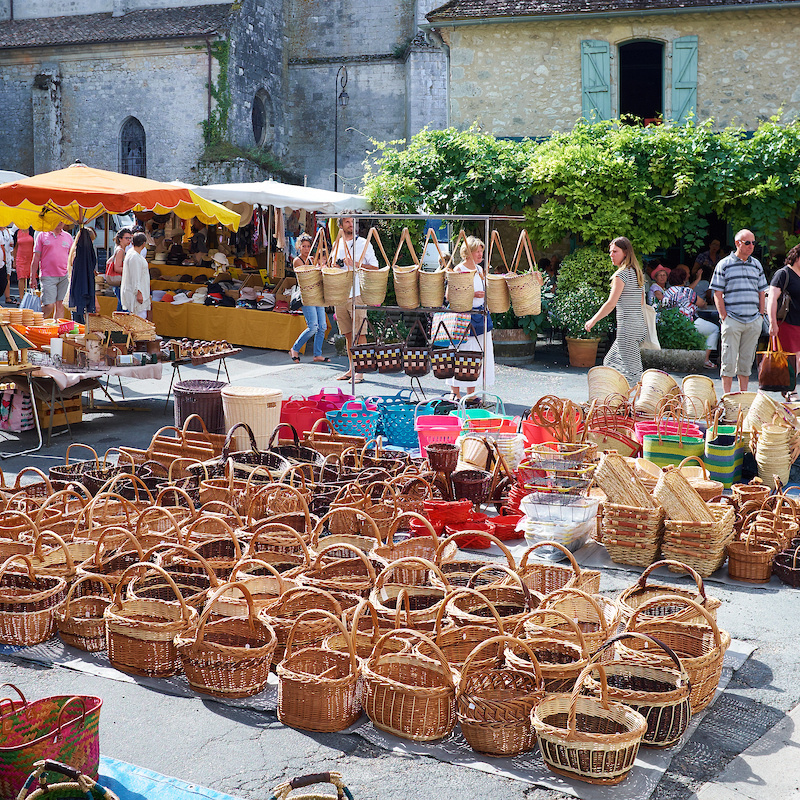 St Foy le Grande - pronounced 'Fwoa' this gorgeous town on the banks of the Dordogne river hosts a fabulous Saturday market with beautiful fresh produce and hand made local produce. 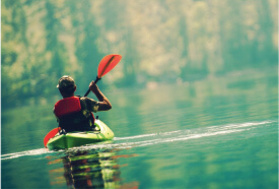 Grand Etang de La Jemaye - composed of six interconnected ponds used for swimming and watersports, you can also walk around the lake and explore natural habitat and local flora and fauna. A safe outdoor space for our younger guests. 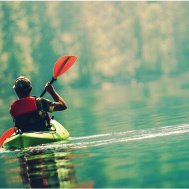 Lac du Gurson - situated near the beautiful bastide town of Villefranche de Lonchat, you can swim and canoe on the lake which has several lovely cafes and bars. 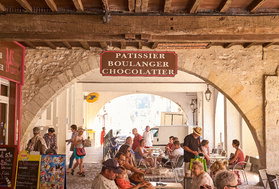 Issigeac - this beautiful 14th century town is a stunning example of French rural architecture and the Sunday morning market is a family favourite. Perigueux - the county capital is big enough to entertain and small enough to explore within a visit. Explore the beautiful Cathedral St Font with its middle Eastern influence and dine in restaurants such as La Taula. 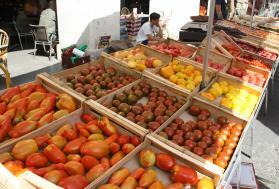 Perigueux holds Wednesday and Saturday markets. 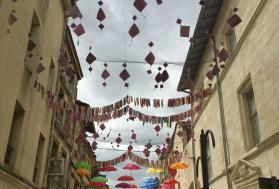 Bergerac - beautiful old town and great shopping in the new town, fabulous wine, Tobacco museum and Cyrano. Whats not to like! The train touristique will drive you around the town to see some of the more unusal sights or or you can float up the river on a gabare. Dine at one of the many bistros or at L'Imparfait or Moutarde. 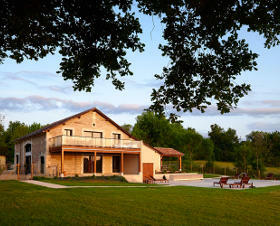 A glass of Pecharmant wine from vineyards north of Bergerac is recommended. Chateau Monbazillac - a beautiful chateau which nestles on the hilltop overlooking Bergerac and watches over the vineyeards producing the delicious sweet wine is well worth a stop to take a peek. 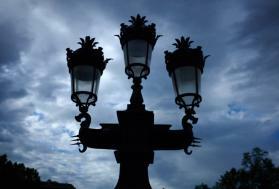 Bordeaux - one of the most beautiful cities in France. Park up at the tram station and let the tram take the strain. The new Cite du Vin is a must see, the Saturday flea market will satisfy even the most quirky buyer, and the architecture is a thing of wonder. Manoir d'Eyrignac - a stunning French formal garden owned by the same family for 22 generations who have sculpted box trees, hornbeam, yew and cypresses into an impressive garden. A must see for anyone interested in gardening. Brantome - Known as the Venice of France you can canoe around the town or further along the Dronne. 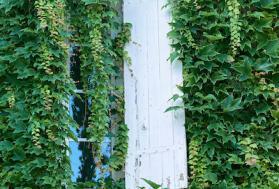 Brantome is famous for its troglodyte buildings and a visit to the Moulin de L'Abbaye is a must. 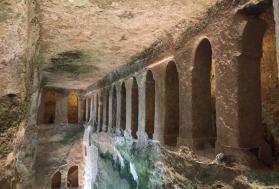 Combine this with a trip to the Grottes des Villars for a wonderful day trip for all the family. Sarlat - this medieval city grew and developed around the great Benedictine Abbey of Caroligian origin. 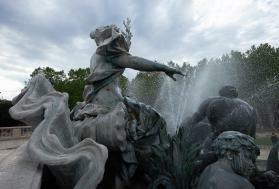 The city has been beautifully conserved and restored and is a must see. 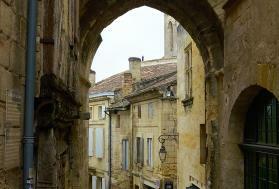 Villereal and Monpazier - both founded by England's Edward 1 in 1284, these towns are fine examples of the bastide style. Each with their unique charms they have stone arcades and a central square, lovely shopping in the brocantes, and lots of delicious restaurants to choose from. 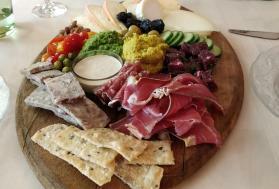 Recommend the La Dolce Vita in Villereal for their delicious lunch menu. Chateau de Beynac and Beynac et Cazenac - mediaeval streets and impressive castle make this a highlight place to visit in the Dordogne, particularly for younger family members. Steeped in history that links the English and French there is something to see and do for everyone. Archachon - with its swathe of golden beaches its a lovely day trip to the coast. You can surf on this coastline and take a cycle around the lovely area. Royan - a beautiful coastline with golden beaches where you can surf and swim. 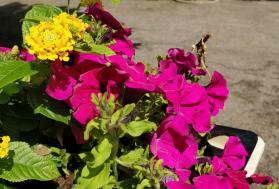 The town offers lots to see and do and has a lovely selection of restaurants. France is famous for the love of all things cycling and fortunately for us we live in an area where cycling is quite easy without too many hills. In the ancient Foret de La Double, you can both road and mountain bike. We have teamed up with our friends from Bike Hire Direct (info@bikehiredirect.com) who will deliver bikes directly to our gites and do everything to make your cycling trips safe, fun and hassle free. You can contact them ahead of your holiday and organise your cycling days to work seamlessly as you bikes are delivered to our gites and collected at the end of your rental period. Easy and fun! Our nearest town, Montpon is on the Velo-route Voie verte de la Vallee de L'Isle, a lesser known route but well worth exploring as it takes you along the river valley of the L'Isle which is a beautiful safe off road journey. Montpon is on the route cycled by Lawrence of Arabia when he was a 19 year old student and wanted to cycle his own version of the Tour de France following the trail of Riahcrd the Lionheart through the south west of France. Our friends from Freewheeling France have this route and many other helpful route maps and cycling advice for cycling en France on their website - freewheelingfrance.com. We love Montpon, Issigeac and Ste Foy le Grand but they all have their own charms and specialities so try them all and let us know your favourites! 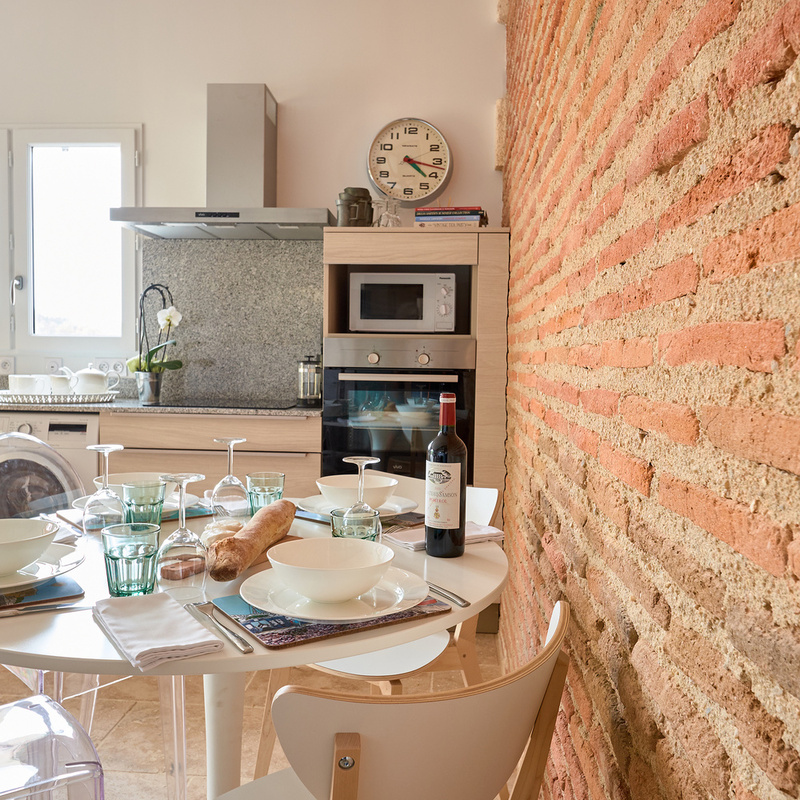 Rural Gites and Louis from Woodbine & Co have teamed up to offer you a wonerful foodie experience in the south west of France. 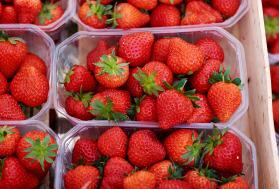 The Taste of France will introduce you to the charms and tastes of the Perigord Dordogne region - a region which is famous for strawberries, truffles, walnuts and of course, delicious wines from both the Bordeaux and Bergerac areas. 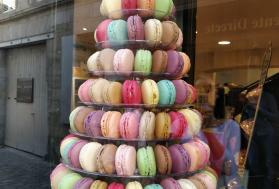 The Taste of France will provide you with amazing experiences during the week of discovering, cooking and feasting. Amongst other things we will be visiting family wine producers creating the most delicious wine, local cheese makers, artisan oil producers and visit markets to bring home fresh local produce which we will turn in feasts together with Louis from Woodbine & Co.
Saturday: arrive at Bordeaux airport by 20.00 where our executive transport will drive you to Chadenne for a welcome reception of local sparkling wines anddelicious canapes on the pool terrace. A lovely time to get to know your fellow guests and the hosts. Sunday: a walk in the Foret de La Double or swim in the heated pool will be followed by a leisurely brunch on one of the terraces. In the afternoon we will take a river trip on the L'Isle from the Moulin Duellas on a traditional gabarre which was used to transport tobacco, wine and foodstuffs. Back for dinner preparation and our Grand Nez smell test to prepare you for Mondays wine tasting. Dinner will be cooked on the Morso Forno wood fired oven by Louis. Monday: after a swim or walk and breakfast in Gite Sanglier we will be heading to the Peyssac region, one of the many secrets of the Bordeaux wine area. 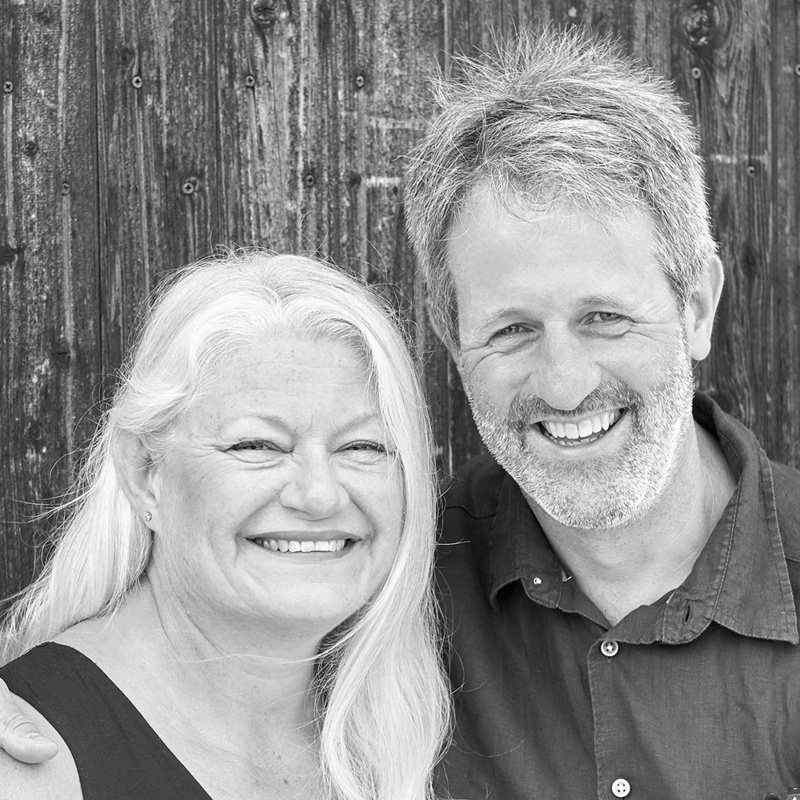 We will be spending time with Jacquie and Wilfrid Franc de Ferriere at their beautiful Chateau Carbonneau. They will take us on a wine tour and tasting and share with us the story of their vineyard and chateau. There will be ample opportunity to purchase wines and afterwards we will lunch in the stunning chateau orangerie. Back to Chadenne for relaxing and dinner prepared by Louis accompanied by wines from Chateau Carbonneau. 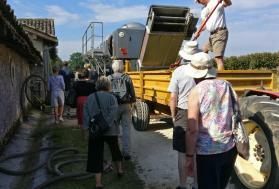 Tuesday: after swimming and breakfast we will be visiting artisan nut oil producer, Christine Elias at Moulin Veysssiere. 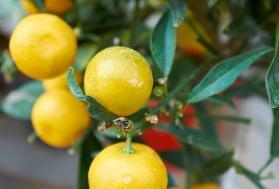 Her family have been producing quality oils in the same way for 160 years. Rick Stein is a recent convert and was cooking with Christine in 2018! After a picnic lunch in a ancient Perigourdine village we will make our way to Duras and meet Stephanie and her beautiful Pyrenean mountain goats. 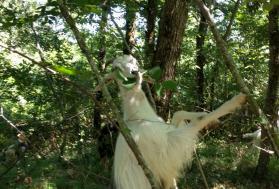 We will hear how she makes the cheese and then walk with her and her goats in the woods in Duras. We will bring some oil and cheese back with us to use in dinner preparation with Louis. 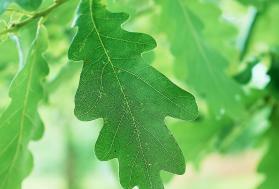 Wednesday: today is a quieter day although an early morning walk is on offer - relaxation is encouraged. 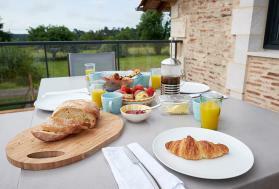 Breakfast on the terrace will be followed by a trip to the local market for those who would like to go. Louis will host a cookery demonstration and work with you to create a delicious lunch from the produce we have seen, bought and tasted during the week. The leisurely lunch will be followed by a free afternoon. Dinner will be followed by an open air cinema evening. Thursday: after breakfast we will make our way to Saussignac to spend the day with Caro and Sean Feelly at Chateau Feely. 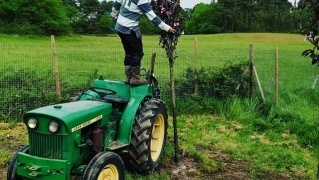 Caro will take us on a walking tour of the biodynamic vineyard and recount the story of the beautiful vineyard and organic wines. You will be guided through an expert tasting with the gifted Caro. Louis will prepare our lunch in the Morso Forno wood fired oven and we will lunch under the trees in the natural amphitheatre overlooking the Bergerac valley. You will have plenty of time to talk to Caro during lunch and taste their delicious wines. After lunch we will make the short journey into the village of Saussignac and take a look at the chatea. Back to Chadenne for dinner and a foodie quiz night. 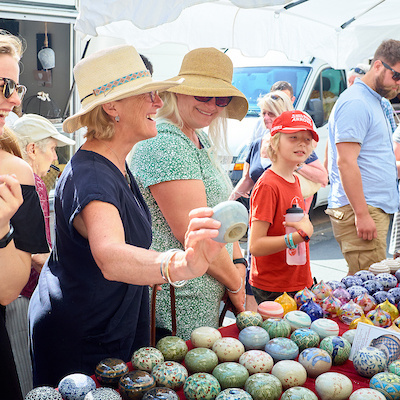 Friday: after breakfast we will head to Riberac market where you can buy locally produced mementos, or sit and have coffee and watch the world go by. After a picnic lunch we will make our way home via Aubeterre sur Dronne. One of France's 100 most beautiful villages where we will visit the stunning monolithic church, a wood fired pottery and have tea and cake before we leave for home. Friday night will see us dining with our friends Deborah and Sebastien at La Clairiere. The food is delicious and the cheesboard a thing of local legend! Saturday: after breakfast, sharing stories and details to keep in touch we will make our way to the world heritage site and the home of beautiful wines, St Emilion for a short stop on our way to Bordeaux airport for flights back home. Saturday 7th September to Saturday 14th September 2019. We have limited the places on the Taste of France to 10 people to ensure you enjoy the best experience and so booking early is advisable. 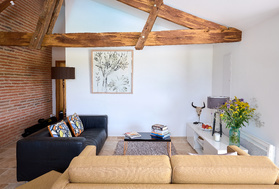 Rural Gites have teamed up with abstract artist Sally Coulden, photographer Jonathan Bowcott and local ceramicist Jo McKinnon to bring you a memorable holiday experience of abstract art and photography in the beautiful Dordogne region of France. 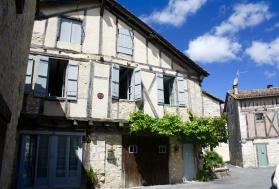 Rural Gites sits in woodland and fields and is peaceful and private - perfect for painting and photography en plein air. 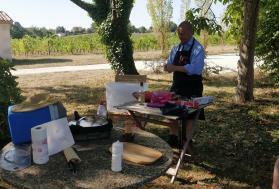 Rural Gites provides exclusive use of the site for the course which is fully catered from arrival to departure. 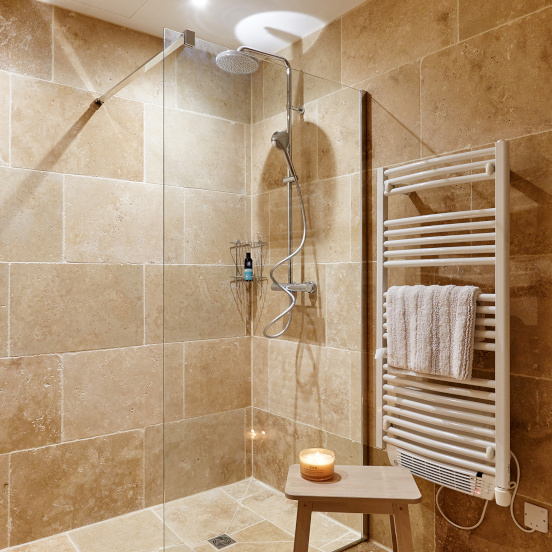 Amenities include a beautiful heated swimming pool and walks through the fields and woods. 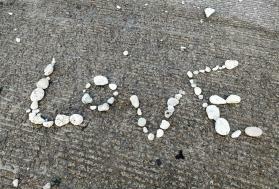 This is a holiday for anyone who is interested in getting a bit creative whilst relaxing in gorgeous surroundings. It's a great blend of photography, painting, sketching and visiting the local area for creative inspiration - finding the abstract in the everyday. Join us at our idyllic countryside location and enjoy art and photography workshops which will help you develop your photography skills as well as providing you with ample opportunity to paint abstract masterpieces inspired by your images. We welcome beginners and experienced painters and photographers alike. The focus will be on teaching you the basics of abstract and painting in acrylics, guiding you through the stages of creating your masterpiece from initial photograph to finished painting and, of course, having fun! I've never painted before - is this the right holiday for me? This holiday is suitable for anyone that would like to try their hand at abstract painting. If you've never painted before or you paint already but have wanted to try abstract this could be for you. It is also an opportunity to learn something new or brush up on your camera skills and who is interested in getting a bit creative whilst relaxing in gorgeous surroundings. It's a great blend of photography, painting, sketching and visiting the local area for creative inspiration. You will learn to use your camera more effectively, understanding how your photographs can provide inspiration from shape, light, dark and lines which then feeds into creating your own abstract paintings. We welcome beginners and experienced painters and photographers alike, the focus will be on teaching you the basics of abstract and painting in acrylics, guiding you thorugh the stages of creating your masterpiece but most importantly, having fun. 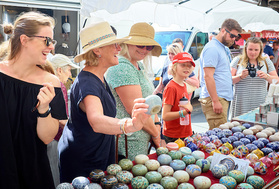 You will also have the chance to visit some of the delights of the region visiting some of its best kept secrets and more popular locations, eat great home cooked food, taste delicious local wines and visit one of the prettiest chateau for a wine tasting experience. Is it a choice between art and photography? This holiday has been designed for you to participate in both activities. The photography and art complement and expand on each other. Each session with our tutors will help you build your skills in a fun and supportive environment. You don't need to be an expert at all as you will find Sally and Jonathan will be there to support you. Sunday: Arrive Bordeaux airport. Transfer on executive coach to Chadenne for afternoon tea and cake, a chance to get to know your host, fellow guests, the surroundings and us. 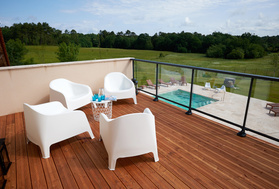 Relaxed drinks and supper on the terrace and maybe a swim under the stars. Monday: Early morning walk or swim, breakfast will be served on the terrace. Jonathan will take you through a morning of photography, photography theory and putting that theory into painting practice. 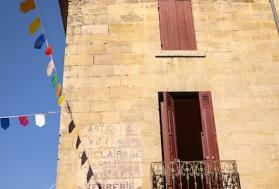 The afternoon will see us visiting the delights of one of the regions prettiest villages, Aubterre sur Dronne. Here there will be an opportunity for photography and sketching of its delights which include the 12th century church St Jean. The interior will hopefully inspire your painting for the week. 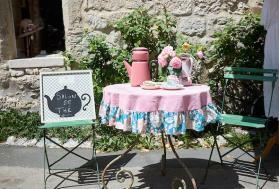 We will stop and indulge in tea and cupcakes in Aubterre. Supper on the terrace. Tuesday: Early morning walk or swim and breakfast. The rest of the day will be spent doing amazing abstract acrylic painting under the tutelage of Sally. Drawing inspiration from yesterday's photographs Sally will take you through the basics of compostion, tonal values, brush control and key elements for creating a great painting. 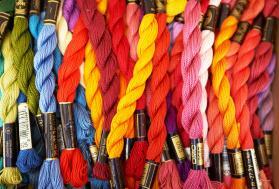 You will be hands on for the whole day creating your masterpieces. Supper cooked in the woodfired oven. Wednesday: Early morning swim or walk and breakfast on the terrace. Jonathan will be running the morning photography workshop and talking more about the themes of the week - the abstract and looking for the abstract in our everyday life. He will reinforce the themes already discussed such as tone, composition and shape and answer questions that may have arisen after the first session. Local ceramicist Jo McKinnon will spend the afternoon taking you through the specifics of painting on white earthenware. You will have the opportunity to paint with Jo on a pottery bowl produced by her. The finished painted bowl will be fired and returned to you in time for your journey home. Supper on the terrace. Open air cinema will be on offer tonight weather permitting. Thursday: After breakfast we will take a trip to the historic St Emilion, home to famous wines and ancient architecture. There will be ample opportunity for photography and sketching before our picnic lunch in the ruins of the Abbe de les Cordeliers. After lunch we will return to Chadenne for an afternoon of Wednesday: Early morning swim or walk and breakfast on the terrace. Jonathan will be running the morning photography workshop and talking more about the themes of the week - the abstract and looking for the abstract in our everyday life. He will reinforce the themes already discussed such as tone, composotion and shape and answer questions that may have arisen after the first session. Local ceramicist Jo McKinnon will spend the afternoon taking you through the specifics of painting on white earthenware. You will have the opportunity to paint with Jo on a pottery bowl produced by her. The finished painted bowl will be fired and returned to you in time for your journey home. Supper on the terrace. 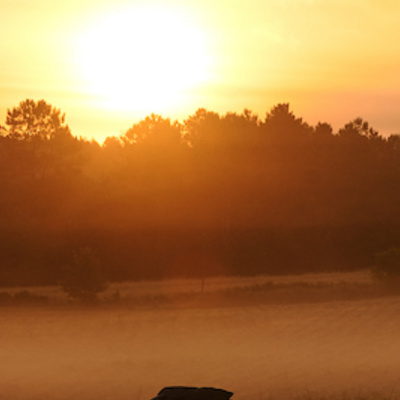 Friday: Following the early morning swim, walk and breakfast Friday is a day where you decide. You can finsh your paintings, indulge in your new found photography skills - looking for the abstract in the everyday - or take some free time to relax and explore the Foret de la Double. If you would like to hire bicycles to explore this can be easily arranged, just speak to one of us. Delicious supper with our friends at our local restaurant La Clairiere with prinks on the terrace. Saturday: Relaxing brunch and last chance for a swim. After sharing stories and maybe contact details, we will return to Bordeaux airport via Chateau Carbonneau for Jacquie's delicious cakes and a bit of wine tasting with Wilfrid. Cost: £1 ,400 per person excluding flights. You will need to arrange your own flights to Bordeaux airport. The cost INCLUDES transfers from Bordeaux aiport to Rural Gites, transport to the visits, meals food at Rural Gites, tea and cake at Cupcakes, dinner at La Clairiere, our picnic in St Emilion and wine tasting at Chateau Carbonneau. All tutelage from our experts - Sally, Jo and Jonathan. It will also include a limited number of prints of your photographs taken as part of your holiday/workshops, your paint, easel, brushes, one canvas and ceramics. Additional canvasses will be available to purchase on site. The cost does not include: Transfers from your home to your departure airport, parking at the airport or any food, drinks and snacks purchased offsite. Drinks or wine at the table - a fine selection of local wines will be available for purchase. The course has a maximum of 8 people to ensure that you all have a fabulous experience and learn a lot! Dates: 2nd to 8th June 2019. A digital camera - it could be a DSLR, a compact camera or a 'bridge' camera. Something that takes a standard memory card. NOT just a phone. A memory Card - We suggest a minimum of 8gb or 16gb. A card reader - so your images can be downloaded to a laptop for viewing and printing. A tripod - If you have one feel free to bring it, if you don't, don't worry, we'll cover holding your camera in low light in the workshop. Spare Camera batteries. Specific battery charger for your camera, Sketchbook. Pencils. Any favourite brushes you have as they are easy to pack. Pastels, oil sticks and charcoal if you think you might want to use them. How do I transport my painting home? We can provide you with cardboard to package your paintings to transport home yourself. Alternatively, we can organise a courier to ship your work home - this would incur an additional cost dependent on size, weight and insurance. Are flights included in the cost of the holiday? No. Flights, airport parking, travel from home to your airport and back is not included. You will need to arrange and pay for this yourself. How long is the transfer to Chadenne? 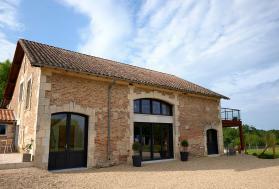 It is approximately 1 hour from Bordeaux airport to Rural Gites Chadenne. What time do I need to be at the airport for arrival and departure? Neuvic sur L'Isle - visit the Moulin de Veyssiere to see the production of exquisite oils produced with local nuts and visit Caviar de Neuvic. Lac du Gurson - situated at Villefranche de Lonchat you can visit the bastide town and swim afterwards at the lac. Jardins du Sardy - beautiful gardens where you will be treated to lovely walks through the gardens and a stunning view over the L'Isle valley. Abbaye d'Echourgnac - visit the abbaye and purchase the famous cheese made by the holy sisters from sheep tended on the abbaye farm. No. You could take the cross channel ferry and drive to Chadenne. We are 6-7 hours from most ferry ports. You can also come by train. The TGV can drop you at Montpon Menesterol. Please call us if you would like travel advice or to discuss alternative options. Will you supply towels or do we need to bring them? We will provide fluffy bathroom towels and separate towels to use by the pool. Yes, we can accommodate different dietary requirements although please be aware that all meals will be cooked in the same kitchen. Please let us know before you arrive of specific food intolerances and allergies. 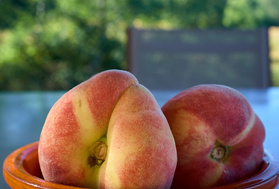 The meals will be home cooked by Annette from Rural Gites from food sourced locally either from artisan suppliers or at local markets to ensure you have the freshest most seasonal delights of the region. The weather in June is usually warm with daytime temperatures in the mid 20's and clear nights which is great for star gazing. Bring a sweater for the evenings. 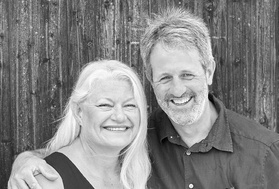 The Marshall family have owned and lived at Chadenne for the last 15 years. Many fun filled family holidays and those shared with friends made us finally decide that it was just too good to keep to ourselves. 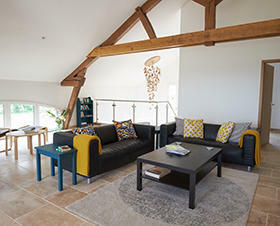 We have spent the last two years lovingly restoring and refurbishing the fermette and gites into comfortable contemporary spaces which are perfect for a relaxing holiday in the tranquil space of the forest. Sit back and look at the huge skies, quietly observe the wildlife and gasp with wonderment at the night sky. We are developing the farm land into a working potager, orchard and beautiful garden with the help of Jill Foxley from the Perfumed Garden. Our aim is to showcase the best of the south west of England and the best of the south west of France by using quality products and produce from both regions close to our hearts. We have had the most amazing 2 weeks at your amazing gite. We are very sad to leave. We all enjoyed the great pool and surroundings. You have such exciting plans for Chadenne and we look forward to following it all on Facebook. Your hospitality has been amazing and we really enjoyed the BBQ with your neighbours. We will back! Thank you for a wonderful two weeks. We couldn't believe the accommodation and pool and the generosity of the welcome pack! We loved the lake at La Jemaye - lovely swimming and kayaks for hire. 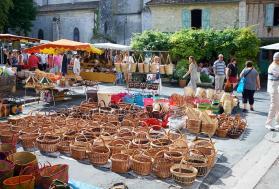 We enjoyed eating at the Auberge d'Echourgnac and the market at Montpon. We enjoyed trips to Aubeterre subterranean church, St Emilion, Les Jardins de Sardy, and the bread shop in St Barthelemy with friendly staff. And the great neighbours! Good luck with your next gite and we hope to see you again. Thank you Annette for a wonderfully relaxing week - a much needed break away from work! The gite is super comfy and had everything we needed, and thank you for all the thoughtful touches for Charlie. We have enjoyed the lake, a day to Bordeaux, Issigeac, and the Sarlat area as well as plenty of pool time and star gazing. We leave feeling re-charged with full tummys and having filled the bottle recycling box! Thank you Annette for a really lovely week at Chadenne. We have had a fantastic time that was due not only to the beautiful areas with so much to do, but also your wonderful welcome and hospitality. Thank you for the beautifully decorated and well equipped gite, the generous welcome pack, the brilliant advice and your patience and kindness to my curious and never-tired children! They loved 'helping' you with the pool duties and so much more. They don't want to leave and neither do we! We loved your recommendations and swimming in the lovely pool. We really hope to be back next year. We have had the most wonderful week here! Our children celebrated their 4th and 6th birthdays in style. Thank you Annette for your thought and care with the bunting, cakes, balloons and activity suggestions to make their days very special. 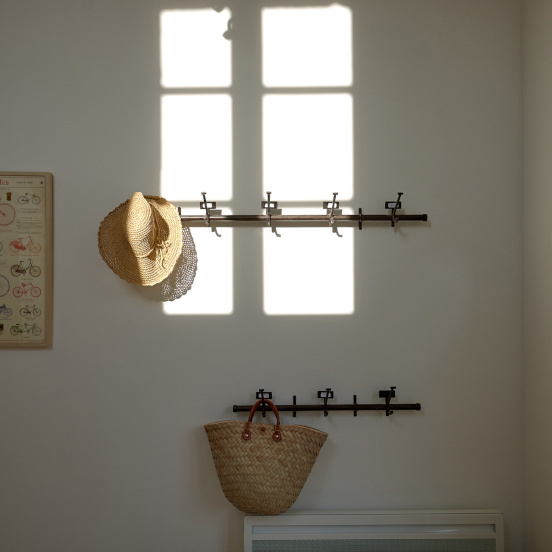 I have loved the elegant space in Sanglier and the peace and quiet of the landscape. We would love to come back. Thank you! We have spent two lovely weeks in Chadenne - so varied its been difficult to choose the highlights. The week on the Taste of France course was such fun. 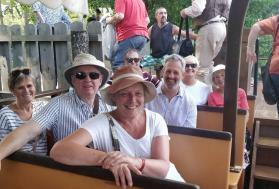 Visits to Chateau Carbonneau and Feely, the trip on the gabarre, walking with goats and of course the wonderful food. other memorable moments were star gazing, the outdoor film show of Salmon Fishing in the Yemen and we loved swimming in the pool. 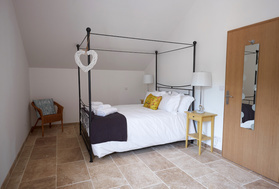 We look forward to returning to see the completion of the third gite and the gardens. We had an amazing week in Rural Gites. Thank you so much for being such a wonderful host. We will miss the house and having the chance to spend a week together. And we will really miss the pool - the babies loved it! Thank you for allowing us to stay in Chadenne it was amazing going in the swimming pool with the lights on and recommending places for us to go. We are falling in love with the area and would love to come back in the future and see how the plans are working out. 'Diddiyn fawr iawn or should we say merci beaucoup! 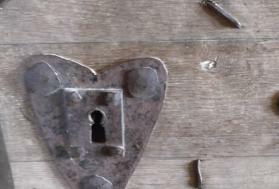 We loved your gite and everything we needed was here. 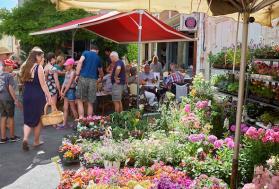 Will always remember the market in Issigeac and watching the hummingbird moth whilst eating pain au chocolat. Thank you for your kindness and generosity throughout our stay. 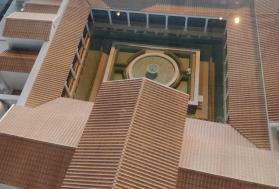 You have created a beautiful, tranquil and peaceful place and we look forward to see your plans work out. 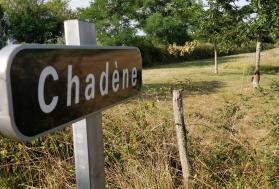 Thank you Rural Gites for a lovely relaxing stay at Chadenne - such a beautiful setting! We all had lots of fun at the house and in the surrounding areas. Tennis courts at 'The Centre of Tennis and multisports' were a great find. We will be back and looking forward to exploring more of the area. We loved the wildlife, the amazing skies and the peace and quiet (although we may have disrupted that!) and of course, the food and wine. Thank you so much for sharing Chadenne with us with much love and continued good fortune. Definitely the first but not the last. Great place, great hosts and area. Enjoy! 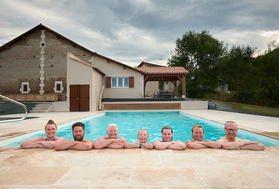 Thank you Rural Gites what a lovely place to be, the pool is great and the living space is so nice. I am looking forward to my next visit and am very proud of you. Thank you so much Rural Gites for such a fabulous week. 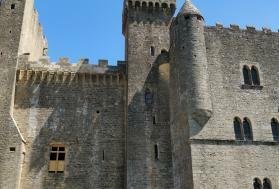 We loved everything from lazing by the pool to visiting Castle Beynac. 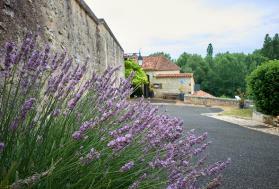 The visit to Issigeac is a MUST! We look forward to returning and continuing the water volleyball championship! Lots of love. Any personally identifiable information that is required to use the SIte is owned solely by us. We do not share, sell or rent your information to any other person, complany or organisation in any way other than is disclosed in this docuemnt or as stated at the point where the information is collected. Our security procedures for storing and disclosing customer details conform with the Data protection Act 1998 so as to prevent unauthorised access to it. The website contains links to other websites. We are not responsible for the privacy practices of owners and operators of these sites. We therefore recommend that you read the privavcy statements and policies on each site to which you are asked to submit personal information. If you decide that you no longer wish to receive newsletters,and promotional and marketing emails you should email info@ruralgites.com with intrsuctions for us to delete your address data from our records. Please note that we reserve the right to change this policy at any time in the future, with or without notice. SHould we decide to change the policy, we will post notification of the changes on this page. 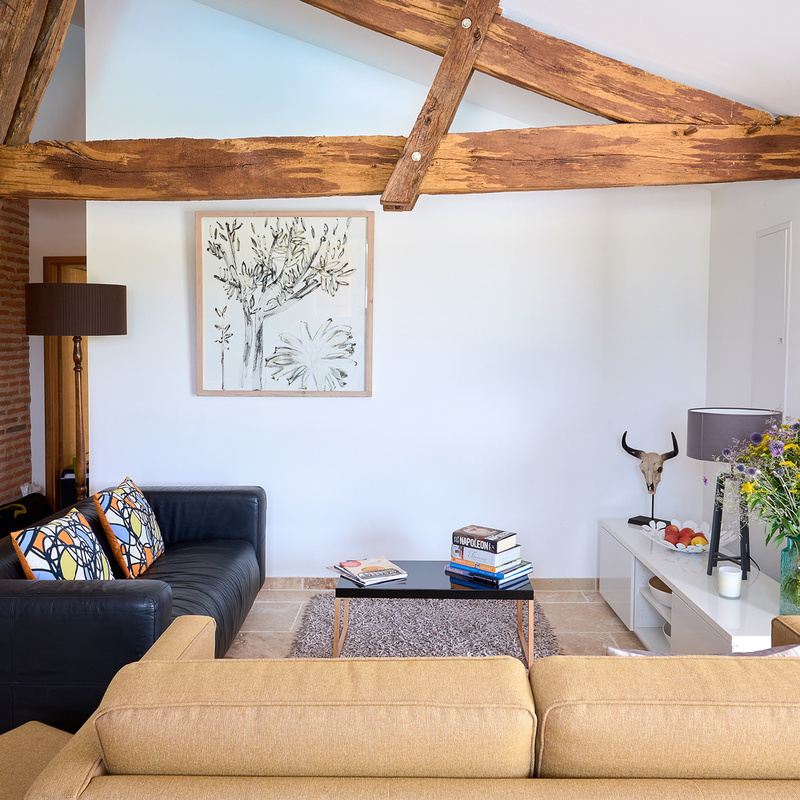 Rural Gites will not sell your details to other companies and will only disclose them to selected suppliers we engage to process data or provide mailing, marketing or research services on our behalf. If you do not supply us with personal details by example using the site to send an email, you are using our site anonymouysly as a visitor. Rural Gites is not interested in the identity of visitors to our site. 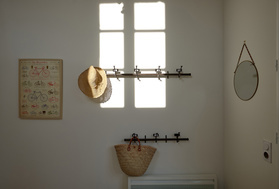 However, Rural Gites is interested in information that tells us about the ue of our site, such as: how many visitors we get, from which countries the site visited, which pages or items are visitoed, and which are the busy times. WE also keep up to date with the type of browser people use when visiting our site so we can change this site to meet the needs of visitors' hardware and software.